This is one of the entries in URS Food Competition last month. 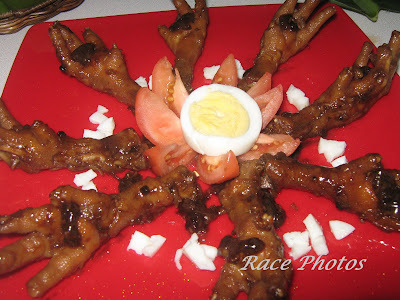 This is the exotic and famous Chicken Feet from the Philippines only :-) Filipinos has more than one way of cooking this one like grilled chicken feet, adobo or cooked with oyster sauce. I just love how they arranged these feet into circle with boiled chicken eggs and tomatoes. Looks yummy! Want some? Click on the badges for more yummy foods! I like it grilled! Yummy!!! nice presentation! i love chicken feet, kahit messy sya kainin. :p the Chinise also love chicken feet--i had boneless chicken feet in HongKong. d ko alam kung papano nila na de-bone ang chicken feet. must be some special knife. Gosh!meron akong naaalala sa chicken feet!Fave ko na street foodies yan.miss eating them a lot!